There are a lot of crippling issues plaguing Zack Snyder’s laboriously titled Batman v Superman: Dawn of Justice, but its most damning misstep is also its most obvious, which is that this film doesn’t understand Batman, nor Superman. Given the well-honed crime-fighting ideologies of each hero, refined over 75-plus years of storytelling, there’s actually a very clear and compelling yin/yang motive for a potential clash between these titans. Whereas God-like Superman, an immigrant welcomed with open arms to our planet, represents the greatest of mankind’s optimism and belief in kindness, the very mortal Batman acts out of pessimism. Birthed from a horrific crime, Gotham’s dark knight is driven by an obsessive need to shield the public from the destructive human behavior that has cursed his own life. While each shares a common goal to maintain order, their perceived end games and methodology are very different, and could inspire a fascinating examination of their dueling philosophies and crime-fighting aspirations. Sadly, Batman v Superman ain’t that movie. At all. This is an ugly, mean-spirited slog, built on a shaky Kryptonite foundation of clumsy franchise-building, that strips each hero of nuance and majesty, leaving only seething, posturing action figures waging a destructive campaign of intolerance against one another. It’s an interesting counter-approach to Marvel’s output, where courage and self-sacrifice is to be championed, and can be found within anyone. The cinematic DC universe seems to feel the role of protector of mankind is an irritating, exhausting chore forced upon angry, miserable brutes with mommy issues. Is this really a message worth running with? Let’s not get ahead ourselves, though. As the film opens we witness Bruce Wayne (Ben Affleck – a genuine casting home run) rushing into a collapsing Metropolis during Superman’s catastrophic final Man of Steel battle with General Zod. Pulling hurt civilians from the rubble, and barreling headlong through clouds of dust, ash and debris, he casts his gaze upwards at the almighty fury raging above and glares wrathfully. It’s a fantastic early sequence, establishing a clear motive for the titular conflict, and exemplifies the very bravery that makes the Wayne we know and love who it is. Sadly, the movie doesn’t seem to realize that. 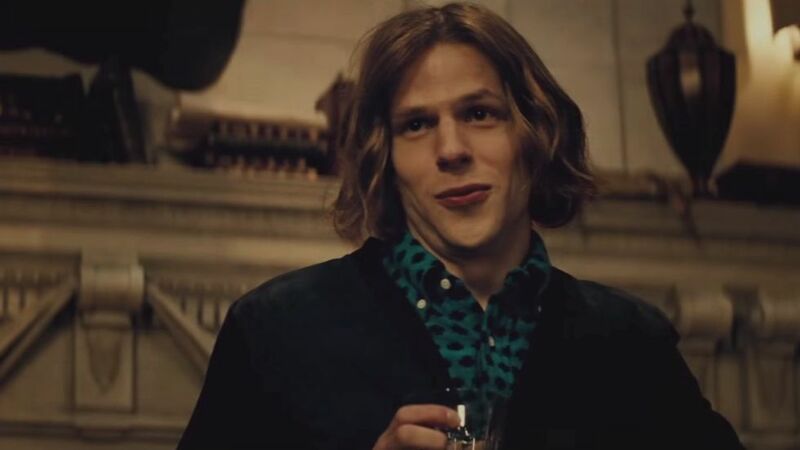 Enter Jesse Eisenberg’s erratic, way off-model Lex Luthor. Determined to declare war on both avengers for dubious reasons we’ll get into later, he initially sets out to sully Superman’s name and influence the world to cast him out as a devil. He also yearns to get his hands on a certain precious glowing green alien rock, which will act as both a weapon against his oblivious foe, and as a key ingredient in a larger, more insane plan. Drawing a resentful and unhinged Batman into these sinister machinations, he kick-starts a feud between the stubborn men which threatens to destroy both the city and the potential for further sequels (no such luck!). To be clear; this is not a concise, well thought out tale director Zack Snyder and writers Chris Terrio (Argo) and David S. Goyer (Man of Steel, Blade) are telling. 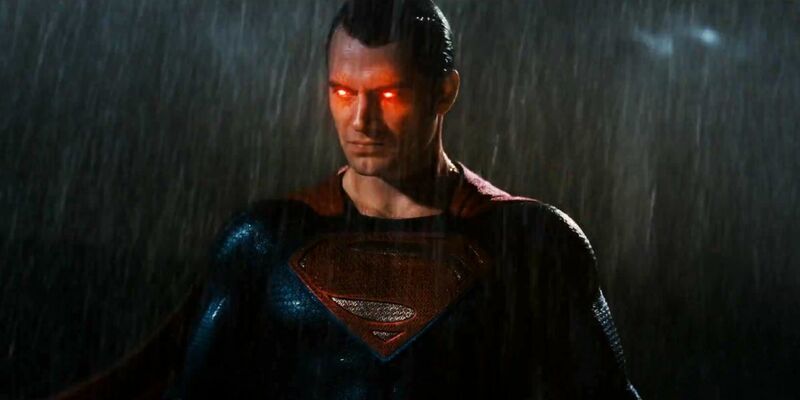 Batman v Superman suffers from the same brand of messy, momentum-killing bloat that dragged down costly disasters like Amazing Spider-Man 2, Transformers: Age of Extinction and Tron Legacy. Mistaking a dour, meandering stew of endless sub-plots for story, the film feels like it's running in a dozen different directions at once without any clear objective in sight. 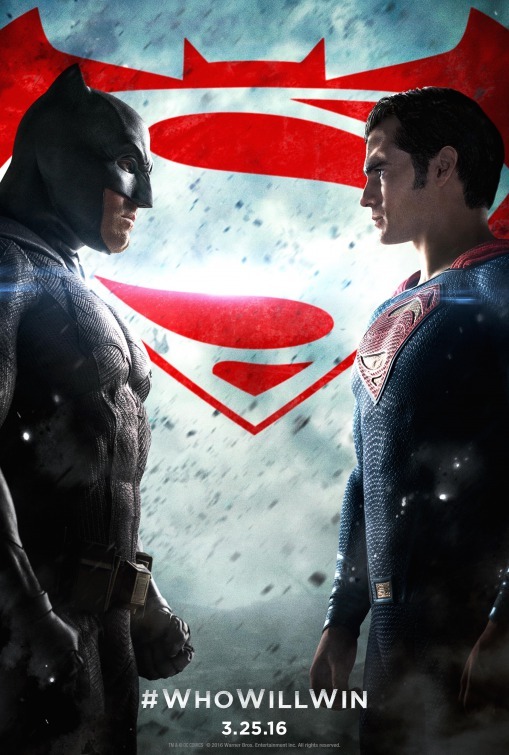 The first half feels overstuffed with happenings, as we follow the two leads’ various escapades, as well as Lois Lane’s (Amy Adams) investigation into high-tech bullets, Lex’s scheming, Alfred the butler’s (a brilliantly cast Jeremy Irons) frustrated handwringing, unconnected Justice League tie-in dream sequences and material involving a conflicted senator played by an unfortunately wasted Holly Hunter. Oh, and Wonder Woman! Yes, Gal Godot’s likable lasso-twirling heroine drifts in and out of proceedings, usually sans dialogue, like a visitor from another movie (don’t worry, hopefully someone will write her as an actual character in her upcoming solo adventure). All of these threads prove far too much for the filmmakers to handle, and it’s not long before motivations go out the window. In a picture this densely packed with incident, it’s tough to clearly communicate to the audience exactly what each character is trying to achieve, why it matters and keep it consistent through an ever-evolving narrative. It’s an unflashy skill, but an invaluable one in long grandiose blockbusters like this. Christopher Nolan proved extremely adept at this feat in his Dark Knight trilogy, for example, however examine a dud like Pirates of the Caribbean: At World’s End where everyone seems to act purely out of frenzied impulse. The results here mirror the latter and feel utterly chaotic, with no one’s behavior tracking scene-to-scene, thus killing off our ability to invest in what we’re experiencing. It’s an exercise in pure futility to sit through Dawn of Justice and logically explain how Lex Luthor’s early plans give way to the absurd conclusion in which a terrible-looking CG blob (Warner Bros. didn’t learn many lessons from Green Lantern, it would seem) rampages through the streets. By contrast, the on-screen journeys of Mr. Freeze and Poison Ivy in Batman & Robin at least make sense on paper! This, of course, brings us right back to the central problem of the film, which is its failure to grasp the central principles of Batman and Superman. People understand what makes these characters tick, so they would in theory make great anchors in a complex, twisty story. Strangely, though, Snyder and co. are determined to reinvent them from the ground up so that they’re barely recognizable. Henry Cavill’s Superman spends his noticeably reduced screen time being hurt, disillusioned (remember how Man of Steel told us his S-logo meant ‘Hope?’ It seems there was a mix-up in the translation and it may have just been ‘Mope.’) and being told by his loved ones – living and ghostly – to refuse the call. There’s nothing inspirational about this Kal-el. Forget setting an example for us all to follow, this version just wants to be left alone, dammit! As for Affleck’s Batman, he’s more vicious and fascistic than even Frank Miller imagined in "The Dark Knight Returns," which the movie steals liberally from. Having seemingly retired his “no kill” policy, this Caped Crusader – a famous victim of childhood gun violence – casually blasts holes in baddies with heavy-duty machine guns and leaves a trail of dead in his wake. These critical changes render the two as murky antiheroes without decipherable moral codes, transforming their compelling light versus dark relationship into an unpleasantly bleak and lumbering smackdown between grim and grimmer. Much could be redeemed if the crucial action set pieces were exhilarating and inventive. After all, Snyder is a born stylist with a great eye, as evidenced by better films like Watchmen or 300, and even an equally clunky one like Sucker Punch. Weirdly, he really drops the ball here. Batman v Superman is shockingly sparse on superhero fighting, and what little there is surprisingly unremarkable, from an incoherent and awkwardly placed Batmobile chase to the title bout which is okay enough but hardly justifies the excessive run-time on either end of it. And the less said about the final battle the better. Suffice to say it’s a visually hideous cacophony of embarrassing effects, flimsy green-screen (the actors rarely even acknowledge each other and appear to be edited together in post) and less than dazzling fight choreography. 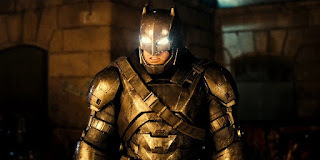 The only time Snyder seems to come alive is in a bafflingly bizarre “Knightmare” (as it has been referred to online) sequence wherein Batman dons a duster and battles fascists and flying insect men in the desert. It’s surreal, odd and colorful, and far more in tune with the director’s past stylistic obsessions than the murky angst it's floating in. It goes without saying the film concludes with a blatant arrangement of pieces for the impending Justice League to run with, however it’s surprising how obligatory and devoid of energy it feels. True to its heroes, I suppose. As the first major instalment in DC’s ambitious stab at a cohesive universe, this is a woeful stumble that will require serious back-pedaling if there is any in-house desire to recapture the engaging inter-personal dynamics fans know and love from the comic books. For Dawn of Justice isn’t just dull, it’s unpleasant, numbing and nihilistic; a superhero epic that would rather spit in the face of pure-hearted heroism than embrace it. This is not the Batman/Superman movie we deserve. Or the one we need right now, thanks.